FAZAL MAHMOOD, who died on May 30, 2005, aged 78, was Pakistan's first great bowler, inspiring his country to several famous victories in the 1950s. "He was the torch-bearer," said his modern counterpart Shoaib Akhtar. 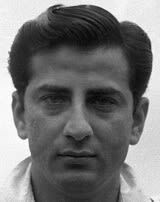 Tall and handsome, with a Comptonesque mop of hair that led him to feature in advertisements as Pakistan's own Brylcreem Boy, Fazal's ability to cut and seam the ball at a fair pace led him to be compared - in style and stamina - to England's Alec Bedser. He was especially difficult to handle on the artificial pitches widely used in Pakistan in the 1950s: Neil Harvey, the great Australian batsman of the time, said that Fazal "could make the ball talk" on matting. When Pakistan beat India by an innings on the mat at Lucknow in October 1952 - only their second official Test - Fazal took 12 wickets, seven for 42 in the second innings. Then, on the inaugural tour of England in 1954, he again took 12 wickets as Pakistan pulled off a stunning series-levelling win at The Oval. England were 109 for two, chasing only 168, but lost their last eight wickets for 34. He took 13 for 114 at Karachi when Pakistan won their maiden Test against Australia, "varying his swing with a mixture of leg-cutters and breakbacks", according to Wisden. Overwork dulled his edge after that: he bowled 250 overs in the first three Tests of the 1957-58 series in West Indies. Fazal still managed eight wickets in the final Test, which Pakistan won. And the following season he became the first Pakistani to reach 100 Test wickets, in only his 22nd match, and added 12 more as they won the next game, against West Indies at Dacca. By then, he was Pakistan's captain, and led them in ten Tests in all. He retired after the 1962 England tour with a first-class bowling average of under 19. Hanif M Find Fazal Mahmood profile and stats of batting, bowling and fielding including latest updated news of Fazal Mahmood, videos and images at Hamariweb.com. Also find detail Player profile and career statistics of Fazal Mahmood of Pakistan. Fazal Mahmood - Find Fazal Mahmood of Pakistan Cricket Team complete player profile, number of matches, runs score, wickets & catches, Statistics, Records, Fazal Mahmood Latest News, Fazal Mahmood Videos, Fazal Mahmood Photos, and other Fazal Mahmood Cricket Team players.